Documentary film on Jim Jones’ Cult and suicides in Guyana. Source video Jonestown: The Final Report. The relatively high suicide rate in France is investigated and a number of influences are hypothesized as causative. These include, on a societal and demographic level, a history of high immigration, low emigration, a high proportion of old people, high urbanization, extraordinarily high alcoholism, and the extreme gap in income between upper and lower classes. The rigid bureaucracy of the state can leave the individual feeling infuriated and defeated. The legal system produces many injustices, such as long imprisonment without charges. The Church is liberal and supplies little prophylaxis against suicide. Overall, social integration must be judged to be low. Culturally, French values include an underlying pessimism, no strong fear of death, strong pressures to behave correctly and much malice toward neighbors. The modal personality structure contains defensive, constricted elements producing a vulnerable pseudo-autonomy. French child-rearing practices are effective in producing such personalities. Pope John Paul II died today at age 84, Vatican officials said. One of the most influential leaders of the 20th and early 21st centuries, he worked tirelessly to build a moral foundation in the modern world, while playing a crucial role in overthrowing communism and fostering peace. SWORD OF WILLAM WALLACE LEAVES SCOTLAND FIRST TIME IN 700 YEARS AND ENTERS MANHATTAN NY ! has never left Scotland and has remained as a historical treasure for over 700 years to this day! March 31st ICOTG NY Officially established after 20 months of preparation. A television news helicopter covering a triple shooting in Brooklyn spun out of control and crashed onto the roof of a Flatbush apartment building last night, snapping in two but sparing the three people on board any serious injuries. 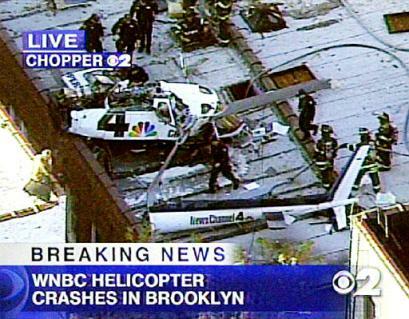 The WNBC-TV helicopter, Chopper 4, hit the roof of a four-story brick apartment building at 2502 Cortelyou Road about 6:30 p.m., and then plunged onto the roof of a two-story building, the authorities said. The helicopter landed in two pieces on the roof of the smaller building, 2514 Cortelyou Road near East 25th Street. ”I cannot believe that three people walked away from that,” a neighbor, Dwayne Simpkins, said. The people on board, a reporter, Andrew Torres, and two pilots, Russ Mowry and Hassan Taan-Marin, were taken to area hospitals. None of their injuries were life-threatening, the police said. TRAGEDY AT FARMER’S MARKET IN SANTA MONICA, CA. The Santa Monica Farmer’s Market was destroyed yesterday when George Russell Weller, 86, may have accidentally pressed the accelerator of his car instead of the brake. This caused the car to go ramming through the barricade meant to keep everyone out of harms way. Witnesses said he was swerving back and forth while accelerating and hitting many people along his path during the 20 second rampage. By the time he came to a stop, he had killed 9 people and injured 63 people. A tenth victim died later adding to the extent of the tragedy. UPDATE: In 2008, the legal case was closed and the city of Santa Monica and other defendants paid $21 million to settle dozens of civil lawsuits as a result of the tragedy. On May 21, a tropical wave moved off the coast of Africa. By June 5, this became Tropical Storm Allison. The storm hit near Freeport, Texas, first then slowly turned toward Houston. Wind and rain pummeled the state until the storm finally moved back over the Gulf of Mexico on June 10th. On the 11th, the center had moved near Intracoastal City, Louisiana and onto nearby Morgan City, Louisiana. The storm then weakened to a subtropical storm and went through portions of Mississippi, Alabama, Georgia, South Carolina, North Carolina, Virginia and Pennsylvania. Allison finally merged with a cold front over the Atlantic on June 18. In its wake 23 people were dead in Texas, 7 in Pennsylvania with 43 total among all the states. An estimated $5.5 billion in damages was done along Allison’s entire path. 75 counties were designated as disaster areas by President Bush.